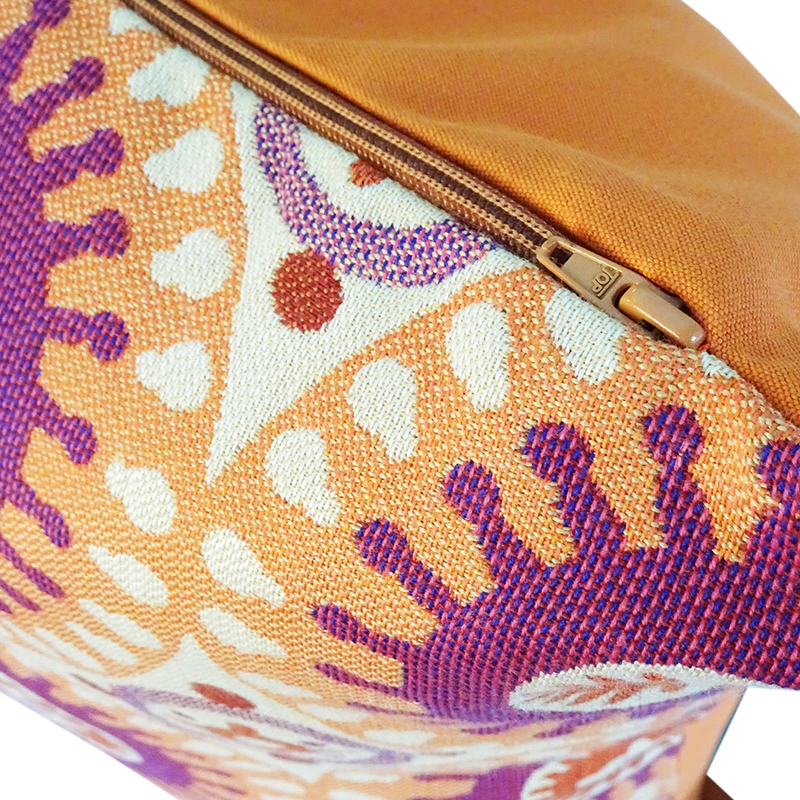 Moroccan inspired Orange and Purple circular patterned Sunbrella front with an Orange Sunbrella canvas back. Made with Sunbrella fabric – fade resistant, water resistant, chlorine, stain and mould resistant. Bleach cleanable. We offer a 5 year warranty against fading. This is for the floor cushion cover only. Inserts are sold separately. 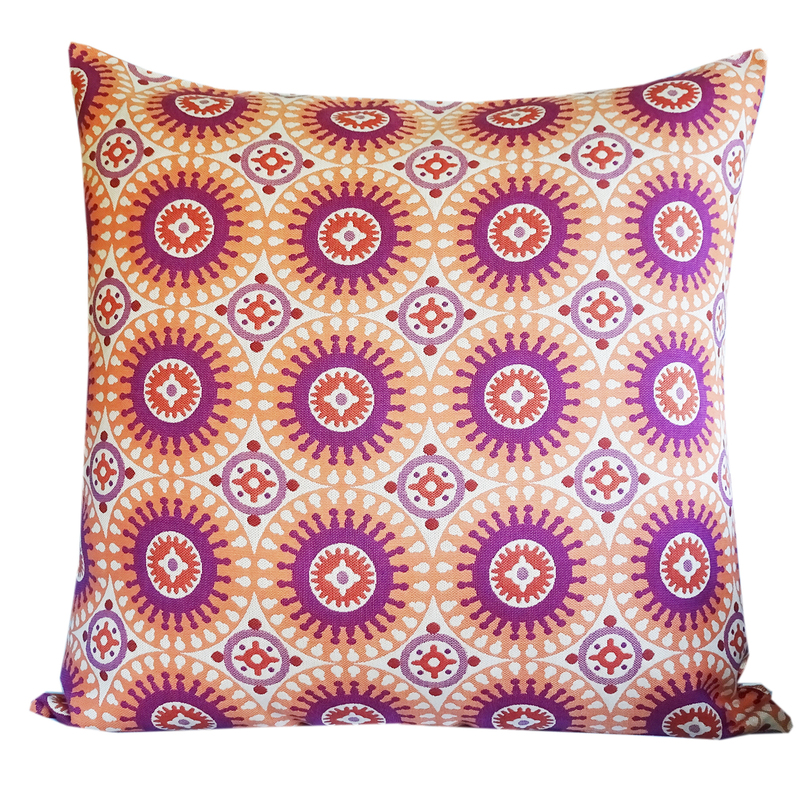 Marrakesh – Orange is a moroccan inspired Orange and Purple circular patterned Sunbrella front with an Orange Sunbrella canvas back outdoor floor cushion. For a Plump Cushion: Cushion insert should be ordered 5cm larger than your cushion cover. Disclosure: Due to colour variations of your computer screen we cannot guarantee the colour you see on your screen is an exact colour match. 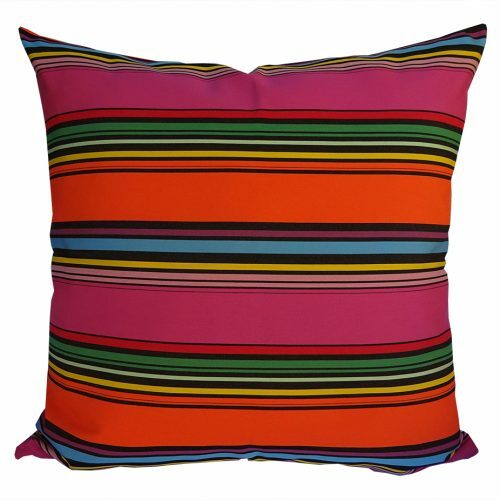 Want to know more about our Sunbrella upholstery fabric scatter cushions? Traditional dyeing processes only leave colour on the surface of the fibre and they will easily fade. They can have an applied finish that will wash off over the course of time. The majority of outdoor fabric manufacturers sell this type of coated fabric designed for outdoor use which are only fade resistant for up to 500 hours of UV sunlight. They are not made from 100% solution dyed acrylic. Sunbrella fibres are saturated to the core with highly UV stable pigments, making our Sunbrella cushions resistant to fading and the degrading effects of sunlight. Sunbrella fabrics’ performance characteristics are an integral part of the fabric. Sunbrella fabrics are 100% solution dyed acrylic. We offer a 5 year warranty against fading with any of our Sunbrella fabric ranges from normal use and exposure conditions. Sunbrella fabrics resist mould and mildew. Should exposure to dirt cause mould to occur all Sunbrella fabrics can be safely cleaned with bleach. To clean, simply brush of dirt and debris before it gets embedded in the fabric. Mildew grows on dirt, pollen and other organic matter, so simple routine cleanings will prevent mould and mildew from forming. Because colour goes into the core of the Sunbrella fibres, Sunbrella fabric can be cleaned using bleach without losing its colour.